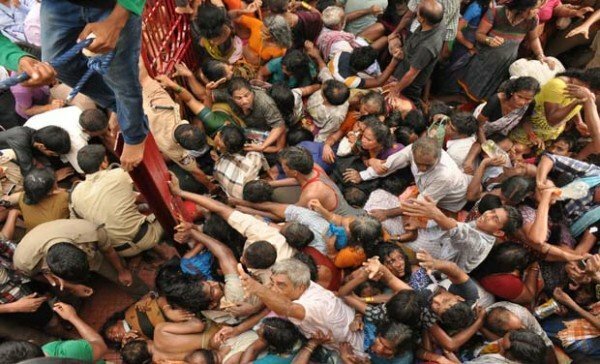 At least 27 Hindu pilgrims have been killed in a stampede on the banks of a holy river in the southern Indian state of Andhra Pradesh, local officials say. The pilgrims had gathered to take a dip in the Godavari River at the start of the Maha Pushkaralu festival. The stampede occurred at 08:00 AM local time in the Rajahmundry district. Nearly 24 million pilgrims are expected to take part in the 12-day festival. Pilgrims believe that taking a bath in the river will rid them of their sins. “The incident happened as the first set of worshippers were coming out of the river after taking a dip and then got in the way of others who wanted to be in the water at an auspicious time,” AFP news agency quoted senior police official A Srinivasan Rao as saying. Andhra Pradesh Chief Minister N Chandrababu Naidu, who bathed in the river at the festival on Tuesday morning, said in a series of tweets that he was monitoring the situation and urged people not to panic. Deadly stampedes during religious gatherings are fairly common in India. In October 2013, 115 people died during a stampede at a Hindu festival in the central state of Madhya Pradesh.